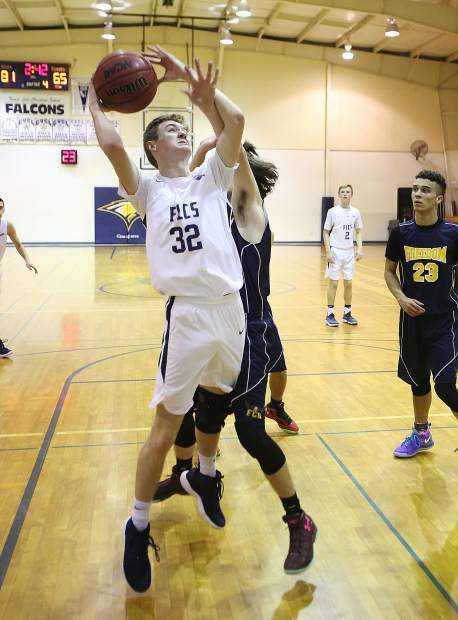 Forest Lake Christian Luke Gilliland brings the ball up the court for the Falcons during Wednesday's playoff win. Gilliland finished with a game-high 29 points, including eight made 3-pointers. Forest Lake Christian's Isaac Willete (32) draws the foul as he attacks the basket in the face of a Freedom Christian defender during Wednesday's 84-65 playoff win for the Falcons. Forest Lake Christian Luke Gilliland (10) vies for a loose ball with a Freedom Christian opponent during Wednesday's playoff win. Forest Lake Christian head coach LaRon Gordon discusses strategy on the sideline with the team during a timeout. Forest Lake Christian's J.R. Molloy flies to the basket during fourth quarter game play during Wednesday's win over Freedom Christian. Forest Lake Christian junior Dominic Cuniberti (3) puts up a quick two points with this layup during Wednesday's playoff win over Freedom Christian. Forest Lake Christian freshman Jack O'Neill lets a 3-pointer fly during Wednesday's playoff matchup against Freedom Christian. 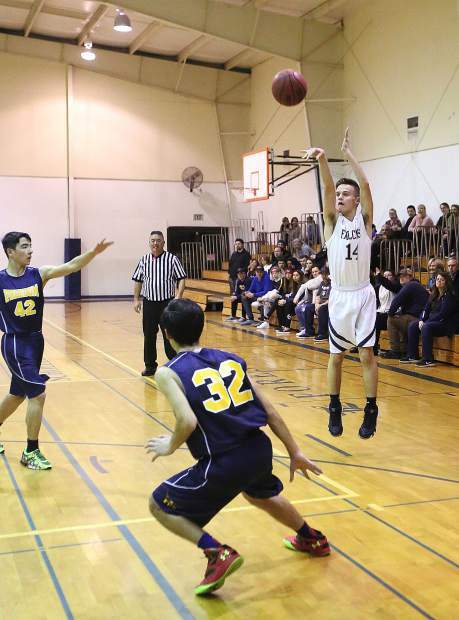 Forest Lake Christian's Aidan Miller (14) fires off a shot from behind the 3-point arc during Wednesday's game. Forest Lake Christian coaches talk it over on the sideline with the team during a timeout. 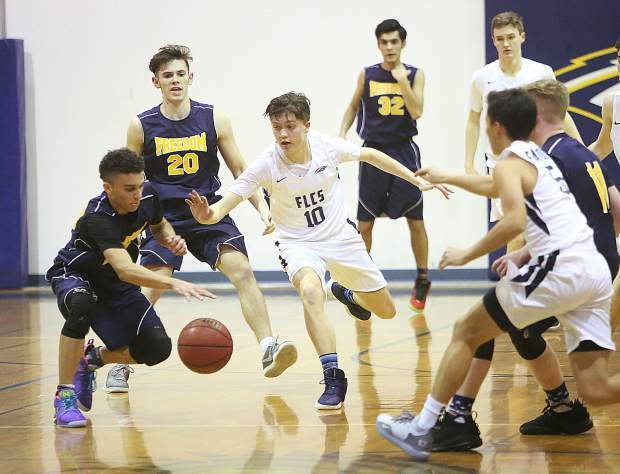 The Forest Lake Christian boys basketball team cruised to a decisive 84-65 victory over Freedom Christian Wednesday to advance into the second round of the Sac-Joaquin Section Division VI playoffs. The No. 5 seed Falcons (14-13) played up tempo throughout the game, out-rebounding No. 12 Freedom Christian and maintaining a high half court press for much of the game. 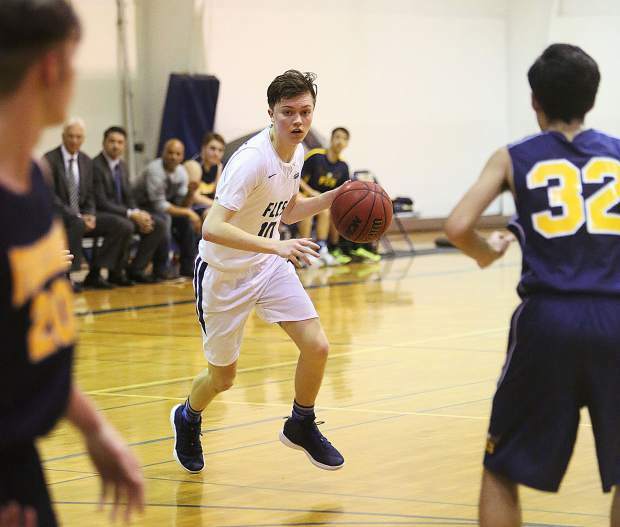 The win was fueled largely by an incredibly hot shooting night for junior guard Luke Gilliland, who drained eight 3-pointers on his way to 29 points on 10-of-12 shooting. He also added four assists and four rebounds to cap off a spectacular night. Junior forward J.R. Molloy was a force in the paint all night en route to six rebounds and 18 points. 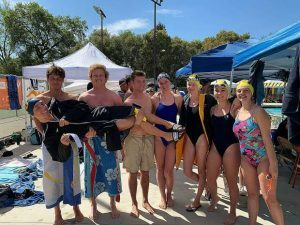 And, junior point guard Simon Blackburn proved to be an unanswerable question for Freedom, putting up a double-double with 15 points and 11 assists along with four steals. 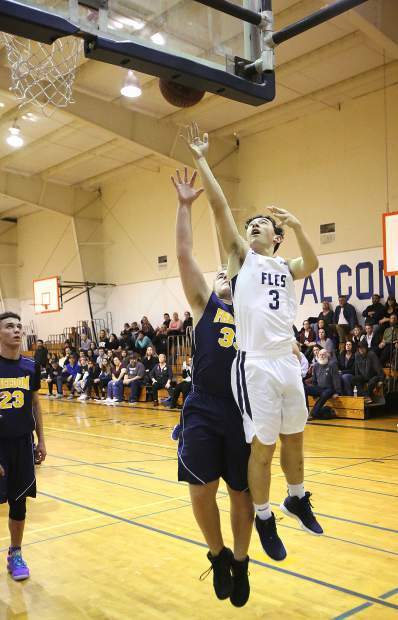 The game started out relatively close, as FLC struggled to capitalize on a handful of Freedom turnovers. 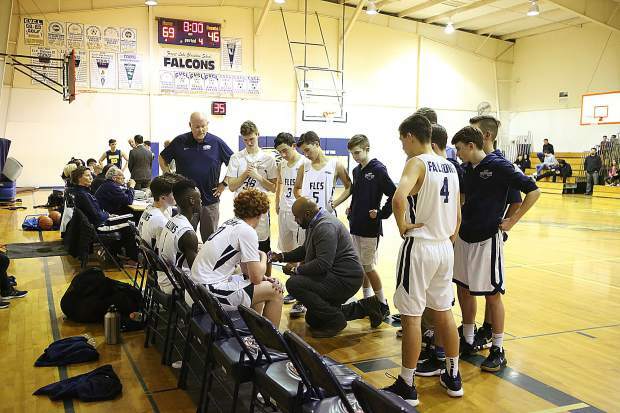 After a sluggish first quarter ended 17-12 in favor of the Falcons, Gilliland caught fire, the tempo markedly increased and head coach LaRon Gordon’s squad pulled out to a 49-30 lead going into halftime. 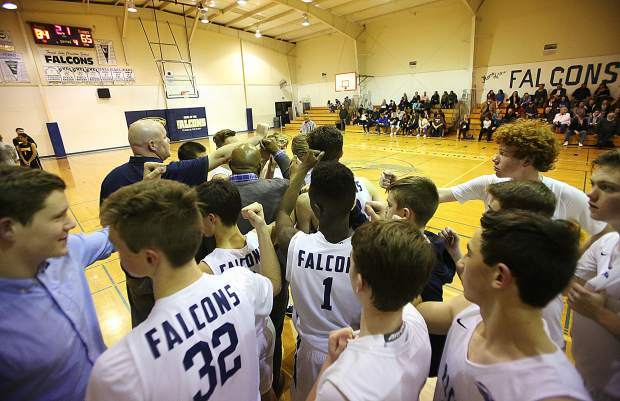 Gilliland stayed hot, the Falcons dominated the boards and clamped down on defense, and by the end of the third quarter the game was all but decided at 69-46. 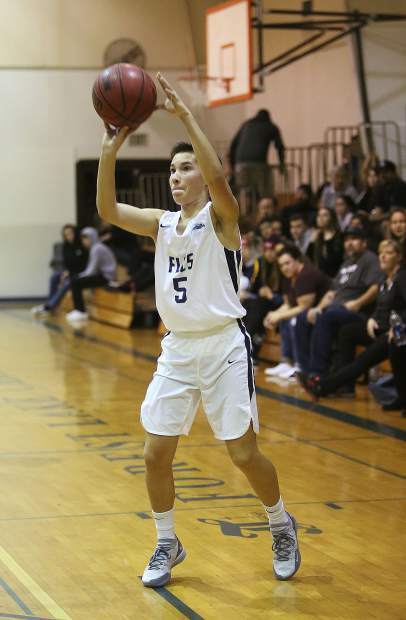 “He’s one of the best three point shooters I’ve ever coached, and when he’s on he’s not even hitting the rim,” said Gordon of Gilliland’s shooting night. 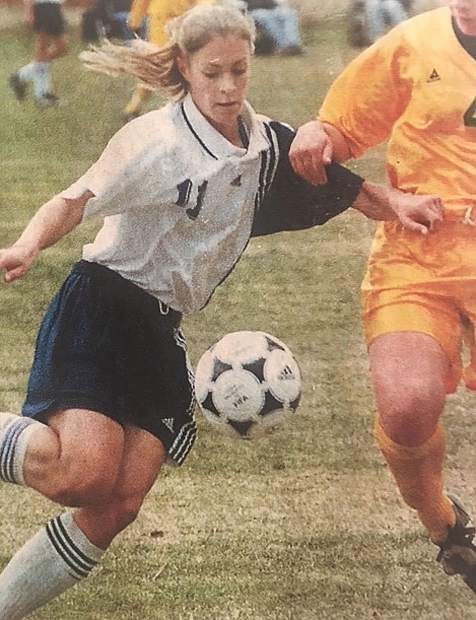 By the time the clock hit zero Gordon had rotated in several younger members of the team who had been called up to the varsity squad for the playoff run and the Falcons had secured their first playoff win of the season. Despite a relatively comfortable margin of victory, Gordon typically aims to allow just 45 points to the opposition, and said defense efficiency would continue to be a focus as the Falcons continue their playoff campaign. Forest Lake’s tempo proved to be a deciding factor, particularly in the second quarter, where FLC outscored Freedom 32-18 and ran away with the game. Gordon said the Falcons conditioning is what allows them to outrun and out-hustle other teams and create those sorts of sustained runs in key moments. With hot shooting, aggressive rebounding and high tempo play the Falcons figure to be a force as they continue their playoff run. Next up for the Falcons is a road playoff game at No. 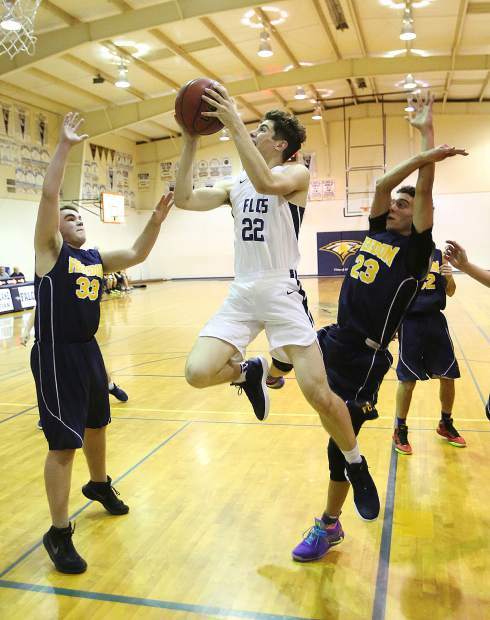 4 Big Valley Christian (16-9) at 7 p.m. today. 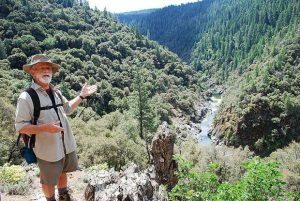 Kael Newton is a Nevada County native and freelance journalist for The Union. He can be reached at kaelnewton@gmail.com or @KaelNewton on Twitter.